Love a slice of cake for your afternoon treat? How about making one of these delicious Ginger And Lemon Cakes? Beat the cream cheese and icing sugar together until smooth. Add enough lemon juice (about 2 tablespoons) to get a good spreading consistency. Preheat the oven to 180⁰C/fan oven 160⁰C/Gas Mark 4. Lightly grease and base line with greaseproof paper two 18cm/7inch sandwich tins. Cream the butter, sugar, ginger paste and lemon rind together in a large bowl until pale and well combined. Gradually beat in the eggs adding a little flour after each addition if the mixture starts to curdle. Sift any remaining flour over the mixture and fold in with a large metal spoon. Divide the mixture between the tins and level the surface with the back of a spoon. Bake for 20-25 minutes until risen golden and firm to the touch. Allow to cool in the tins for 5 minutes before turning out onto a wire rack. Peel the paper off the backs of the sponges. Spread half the cream cheese mixture over the tops of each sponge right up to the edges. Drop spoonfuls of the lemon curd randomly over the cream cheese mixture then using a skewer or teaspoon pull through the lemon curd to create a swirled effect. Sandwich the cakes together and lift onto a serving plate. Decorate with fresh flowers or mini chocolate eggs. 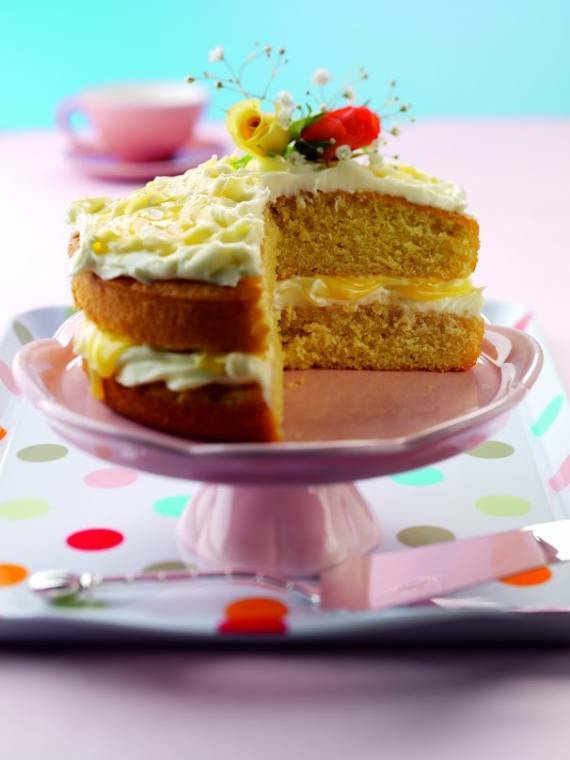 Recipe and photo credit by English Provender Co.
What do you think about this Ginger And Lemon Cake? Fancy sharing a slice or two with friends or family? Looking for more Afternoon Tea recipes? You Might Like: Afternoon Tea Recipes. "14/03 Link Up Your Favourite Posts This Week : Welcome To The Weekend Hop …"
Goodness! This is beautiful and looks delicious! This cake sounds so good. I like ginger and I like lemon so I think that it would be impossible to go wrong with this cake. Thank you for sharing at Happiness is Homemade link party.